An Ode to My Needles. Can bring so much pleasure and glee. Or cuss when my stitches break free. When we bind stitches off as we’re done. Makes wielding our needles more fun! We have some new yarn!! It’s Schoppel Cat Print Hand Dye Collection. The yarn is already wound into two balls to make sock knitting easy. The yarn is 75% Virgin Superwash Wool [Hand Dyed] – 25% Nylon and there are 459 yards per 100 gram ball. $23. 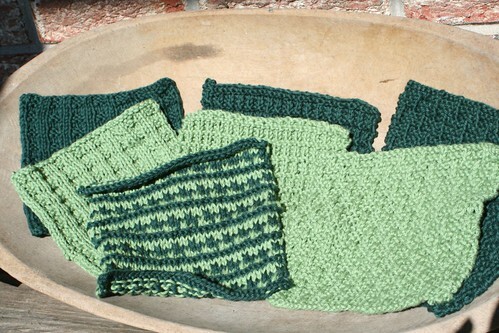 A bunch of dishcloths by Deanne. Another Christmas sweater by Lisa. Yoko made a beautiful butterfly canvas. Terry’s bag came back from the finisher. A bunch of Georgie’s canvases going off to the finisher. A bunch of Leona’s canvases heading to the finisher.